I believe I just found my favorite remix of the new track by Justice called "Civilization" by Neon Stereo. The first listen to the original mix, I did not like this song that much but the more I listen to it the more I like it. If you haven't heard of Justice then shame on you! But I forgive you and you can check out some of their older songs by clicking "Read More" below. You can listen to the original mix by watching the youtube below. downloaded.. jesus terrible work day for me! I think I'm gonna just stop blogging here. Sigh, when that song came out, I thought it sucked so hard. How long has it been? I already want it so bad. The remix was pretty good btw, dig the sound, but it isn't a Justice track anymore, it sounds a lot more like Justice being sampled, props to Neon Stereo. the song is alright, like it's not as good as their old stuff, definitely more poppy and global. oh well. I think we can all agree on the fact that JUSTICE is just awesome. Great remix. I've always liked justice. this new one is good too. just listened to all this while blogging. loved it! I tripped out sufficiently to this to consider it good. Not really my trip, but I can see the talent behind it! justice never gets old! they always know how to come with a fresh sound! Love seeing some cliche "SO MAINSTREAM" comments, but I really want to know how much Justice got for the Adidas advert. Listened to it and liked what I heard! Maybe I need to listen to it a few more times to like it. Damn, I love all of this. 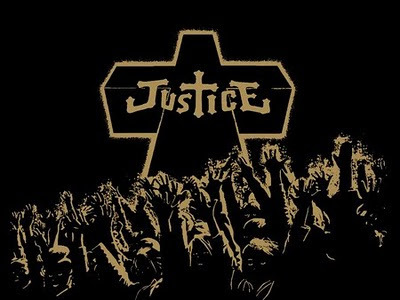 Have loved Justice for a long time now, fantastic. I've been similar to you about the tune. It's definitely a grower and that remix makes you listen to it in a different way. Darn it! I listened to the remix first, and now the original song seems like a lesser remix.